Flow cytometric analysis of untreated Jurkat cells using Akt (5G3) Mouse mAb #2966 detected with Anti-mouse IgG (H+L), F(ab')2 Fragment (PE Conjugate) (blue) compared to concentration-matched Mouse (G3A1) mAb IgG1 Isotype Control #5415 (red). 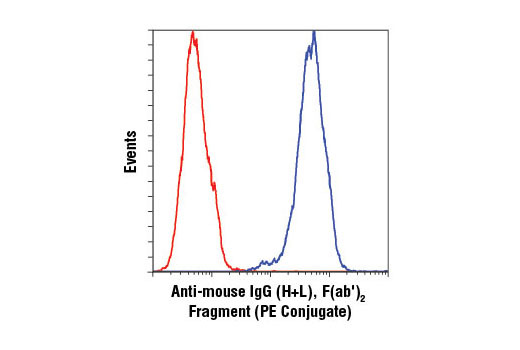 Anti-mouse IgG (H+L), F(ab')2 Fragment was conjugated to phycoerythrin (PE) under optimal conditions and formulated at 1 mg/ml. This F(ab')2 fragment results in less non-specific binding to cells through Fc receptors. This product has been optimized for use as a secondary antibody in FLOW ctytometry. Fluorescent anti-species IgG conjugates are ideal for flow cytometry and immunofluorescence. Cell Signaling Technology’s strict quality control procedures assure that each conjugate provides optimal specificity and fluorescence.